Two years ago, I decided to take the Advanced Herbal Course with the Herbal Academy. It has been a wonderful experience! Now that I’m wrapping up the course as a student, I’m so excited to begin sharing a series of articles about important things I’ve learned on my own herbal journey. I hope they will also help you as you continue to grow as an herbalist! I will offer some suggestions designed to help you think strategically about getting your own herbal education and explain how the Advanced Herbal Course has helped me move closer to my goals. Before we get started on the blog series, I’d love to share my review of the course. I’ve studied herbalism for more than a decade, so I already had a good understanding of herbs and theory before I began. For full disclosure, you should also know that I have worked for the Academy and am an Associate Academy Educator. I love the Academy’s approach to herbal education and would fully support them even if I were not an affiliate. I worked on the Advanced Herbal Course when I was part of their writing team, which is how I found out about the course in the first place! It was amazing to see all of the incredible herbalists who were on board with the Advanced Course project. I quickly realized that I wanted to enroll as a student so that I could glean from all the perspectives the Academy tapped for the program. I also felt like it would be an excellent way to review what I know and a good way to lend legitimacy to the years of study I already have under my belt. The Academy has an affiliate marketing program that allows bloggers like myself to earn commissions on sales of their courses. I review all herbal courses that I take regardless of whether they have an affiliate program (like this one by Herbal Medics, which does not). Being an affiliate is a nice bonus for me, but not the reason I recommend studying with them. 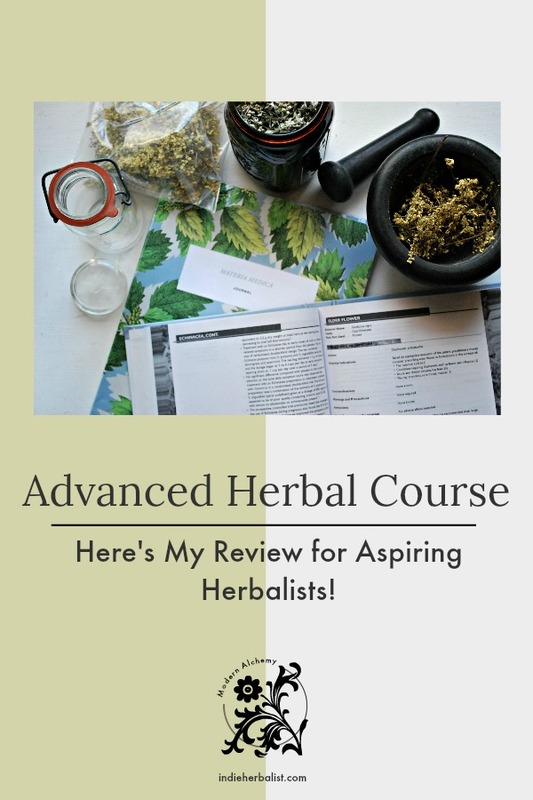 Now that I have completed the Advanced Herbal Course as a student and not just as a writer, I can say that I highly recommend this course for aspiring herbalists. This is one of the most thoroughly researched and well-organized online courses available. Additionally, the instructors at the Academy are always responsive and happy to answer questions or address concerns! Here are some of the highlights that make the Advanced Herbal Course such a great investment for continuing your herbal education. These are things that I think really set the course apart from anything else available online. They are also the reasons I think you should level up your herbalist skills by taking the Advanced Herbal Course! An entire team of educators collaborated to create the course, so you benefit from an incredible amount of knowledge and expertise. The Academy’s founder does a brilliant job acting as a facilitator to bring many different herbalists together for a common goal. The course is very well researched and referenced throughout. Every lesson even provides a selection of books and resources to help you further explore the topics covered. I love that the Academy is just as comfortable discussing the finer points of various herbal traditions (Like Traditional Chinese Medicine and Ayurveda) as well as acknowledging modern scientific research. I think you will find yourself going back to read through your lessons from time to time even after you’ve finished the course. There’s so much useful information in each lesson! The Academy excels at creating a gorgeous experience for students. The course software is intuitive, uncluttered, and easy to use. The photography used throughout is beautiful, and there are many downloads and worksheets provided in the lessons that are also beautifully rendered. If you are familiar with the Academy’s blog or their short courses, you will be thrilled to know that the Advanced Herbal Course is put together with just as much care and professionalism. The goal of the Advanced Course is to provide a quality education for people interested in working with herbs at a clinical level. Thus, there is a heavy emphasis on herbal theory, anatomy and physiology, ethics, and scope of practice. The Course stays true to its mission through every Unit. Who will benefit from the Advanced Course? Overall, I recommend the Advanced Herbal Course as a great option for intermediate level herbalists. It is structured, detailed, and has a lot to offer. This is especially true if you have a specific interest in clinical herbalism, as the Advanced Herbal Course will prepare you to work in a setting that may include networking with medical professionals. The Advanced Course is a flexible option to work around other commitments. You can set your own pace and it’s location independent. You can access your lessons and courses from anywhere as long as you have an internet connection. So if flexibility is important, the Advanced Herbal Course will be a good fit. This course is also a good fit as a credential to demonstrate what you already know in herbalism. I have taken many shorter courses and done a lot of independent study. However, it’s been difficult to present what I know and how I know it in a cohesive way. This course gave me a lot of confidence because now I have a simple way to demonstrate what I know. 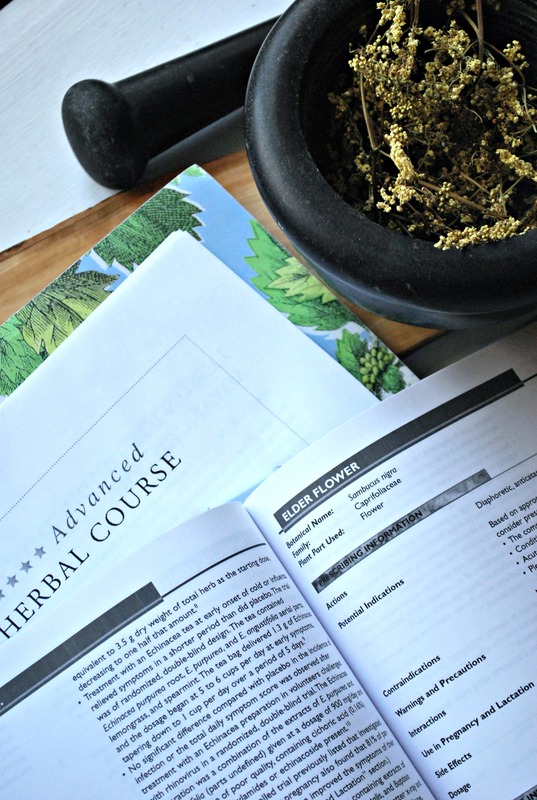 It’s also good to know that The Advanced Herbal Course applies toward the peer review process with the American Herbalist Guild. If pursuing that credential interests you, this course may be a good option. Certain things stood out as particularly helpful and interesting while I took the Course. Here’s a peek at what I especially enjoyed! Short, hands-on exercises are provided for each Unit. Students complete them before moving on to the next Unit. The exercises help you develop what you learned in the Unit and begin to apply it. It’s important to step away from the computer and immerse yourself in your studies! There are quizzes at the end of each Unit that unlock access to the next. Some of the quizzes are more difficult than others, but you have the option to retake them as needed. Besides helping with lesson review, it provides a real sense of accomplishment as you work through the course. Short herbal monographs are provided in each lesson. However, students research and write 20 full herbal monographs of their own. This was a great way for me to explore some herbs I’ve been wanting to learn more about. It also helped take my understanding of several old favorites to a new level. There are a few things about the course that surprised me a little, and a few ways I think the Advanced Herbal Course could be even better. These included some inconsistencies in the tone from lesson to lesson and a few poor quality recordings. There were also fewer case studies than I expected. Overall, I don’t feel that things are detrimental – but you should know about them nonetheless. I was a little disappointed as I took the course that I rarely knew who, exactly, I was learning from. All of the lessons are incredibly well researched and have a distinct voice from each writer. Why not celebrate that by giving each voice a name, or at least mentioning whose expertise was tapped for each lesson? The writing styles vary widely from lesson to lesson, so you know you are learning from different herbalists. Alternatively, if they want an anonymous, text-book approach, it might make more sense to do some developmental editing to make the course voice feel more cohesive. The style of recordings varies widely. Some recordings are professionally recorded videos, some are vlogs, and some are Powerpoint presentations with voice-over. This wouldn’t be a problem- I think that the variety of media is actually a strength- but the quality of the audio recording also varies widely. I’m a musician and have experience with audio recording, so this one was especially difficult for me. It might not bother other people as much! There is also no way to download the videos, so you won’t be able to save them for reviewing once your access expires. However, the Academy added downloadable transcripts while I was taking the course, which I thought was great. Sadly, the beautiful format for each lesson doesn’t always translate well into PDF and/or black and white printing. Sometimes the format is a bit odd in the PDF from awkward page breaks. Some of the lessons are quite lengthy, so it helps keep costs down to print in black and white instead of color. Unfortunately, some of the colors for headings and in worksheets are too light to translate well into grayscale. Having a hard copy helped me study, but I saved the PDFs to my computer so I can use them for review. I found less information than I expected on developing herbal protocols in some Units. That surprised me a little. There were also fewer case studies than I expected. The anatomy and physiology covered in each Unit, on the other hand, is very complete. The instructors also do a wonderful job covering information that’s important to know as you develop a deeper understanding of health and potentially begin to network with allopathic health professionals. Short herbal monographs are provided in each lesson. However, I felt that the rationale behind using certain herbs vs others wasn’t explored fully. The details of using energetics and specifics in practice (not just in theory) was also somewhat lacking after Unit 2. I would have liked to see a wider variety of herbs introduced via the monographs. Many of the herbs discussed are probably well-known by intermediate herbalists. As much as I love the Advanced Herbal Course, there are a few instances where I might NOT recommend it. I think it’s important that we talk about that for a minute. After all, my job here on the blog is to provide you with good, solid information from several perspectives. So, why WOULDN’T I recommend the Advanced Herbal Course? The Academy sometimes promotes the Advanced Herbal Course as a way for medical practitioners to gain a better understanding of herbalism, but I don’t know that I agree. After the first few Units, most of the course focuses on anatomy, physiology, and pathology. There is a little herbal info or a case study tacked on in each unit. The herbal history and general herbal theory from the first Units might be helpful, but after that the course would likely be review. If you already know the medical field well and are familiar with common allopathic protocols, in my opinion you will be much better off if you skip the course and read a few good herbal books instead. I would recommend Medical Herbalism by David Hoffman, and then follow up with The Earthwise Herbals vol 1 and vol 2, The Earthwise Herbal Repertory, and The Practice of Western Herbalism (all by Matthew Woods) instead. Those provide a very solid background in Western Herbalism. If you’re interested in a Traditional Chinese Medicine perspective, The Web That Has No Weaver by Ted Kaptchuk is one of the most accessible and thorough books available on TCM theory. 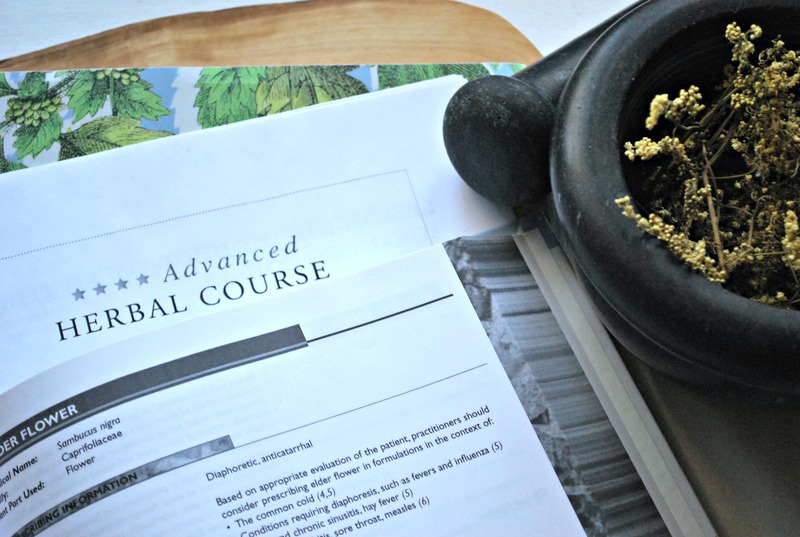 If you want a certificate of completion in herbalism as a professional credential, the Advanced Course might still be applicable. Do remember, however, that it is a certificate of completion, and not an official certification. Most herbal schools are small and not accredited. Plus, there is no formal accrediting body to make anyone a “certified” herbalist. This isn’t necessarily a bad thing, but it is something to remember as you consider your options. If an accredited degree is more important to you, something like the programs at Maryland University of Integrative Health might be a better fit. However, I think that the Advanced Herbal Course is a fantastic option for intermediate herbalists ready to take their herbal skills to the next level! It will be especially applicable for home and folk herbalists who have mastered introductory and intermediate skills and are interested in learning more about the clinical side of herbalism. The course is thorough, well-researched, and offers myriad perspectives that provide a rich and detailed experience for the student. The format and organization of the course offer a solid framework for immersing yourself in your studies with a professionally facilitated herbal school. You can find more information about the Advanced Herbal Course on the Herbal Academy’s website. They also offer a Clinical Herbalist Path package that includes their Introductory, Intermediate, and Advanced Courses. 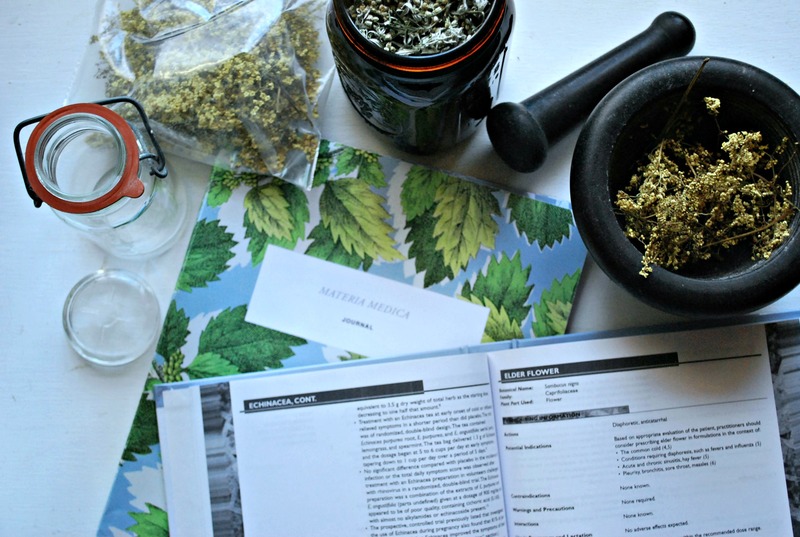 This year I’ll be sharing some great resources for continuing your personal herbal journey. As always, we will explore ways to enrich your own health with herbs. I will also be sharing my insights and offering guidance and inspiration for following your path to an herbal career. You can find more of my thoughts for each Unit in the Advanced Herbal Course in the articles here over the next few weeks!